Sprouting Store-bought Sweet Potatoes WIN!!! ATTENTION GARDENERS: Do you love to grow sweet potatoes from your own slips but cannot find organic, untreated potatoes? 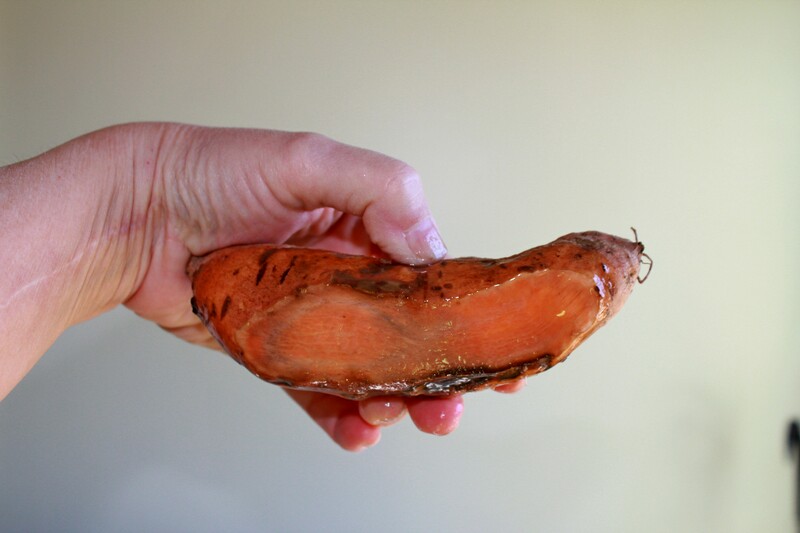 If you’ve ever tried to sprout your own slips from store-bought treated sweet potatoes only to have them look and smell (whew) like this after three weeks, have I got great news for you. I found a way to get store-bought sweet potatoes to sprout. 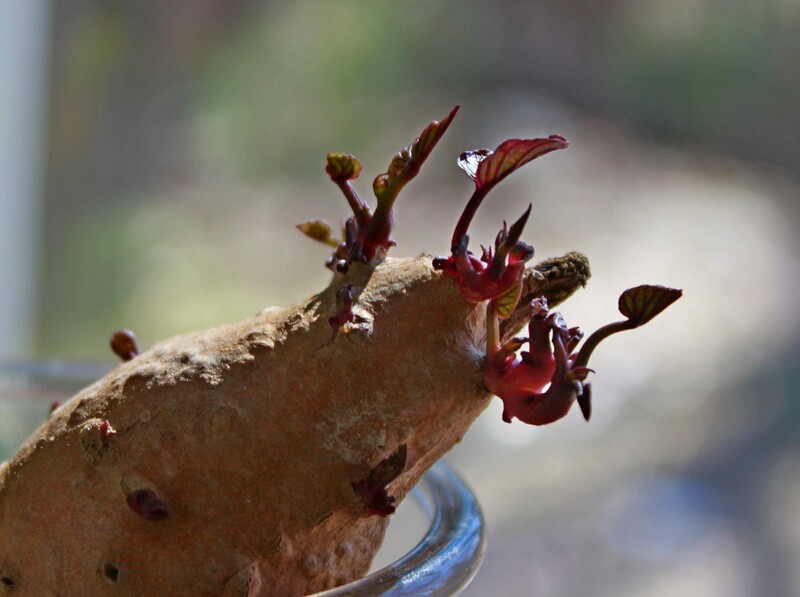 Part of me wants to bottle my solution and make a few bucks, but the other part simply wants to get the word out to as many fellow gardeners as possible while there is still time to sprout sweet potatoes for your 2013 garden. Please share this post with as many gardeners as you can. I did the same thing with two more store-bought sweet potatoes, only this time, I tried an Indian method of starting slips. I sliced off a longitudinal, thick peel off one side of each potato and placed them, cut-side down on a wet paper towel in a glass pie pan. I kept the paper towel and cut side of the potatoes constantly moist. Three weeks later, I had no growth from my control and several buds and roots from my treated potato. Not as many as the vertical method but I’m still happy with the results. My friend, Sue Monroe is performing similar tests just to verify that it works for her. I got the idea from doing a bit of research on what the chemical is that is routinely used to treat sweet potatoes and regular potatoes. When I found out that out, I went to its MSDS sheet and discovered that Ascorbic Acid would neutralize it in case of spills, etc… That gave me the idea to try Vit. C as a neutralizer for the chemical on treated potatoes. Haven’t tried it with spuds yet. Wouldn’t that be a hoot if worked on them as well? Let me know what YOUR results are. Thanks for this, I’m going to try it! My sweet potatoe is rooting just fine in water for a month now but no signs of bud formation. I’m thinking whatever they treated it with is blocking the buds from forming! Hi Susan. I have never grown sweet potatoes in a container except for their foliage. The roots need space and the plant stems root occasionally along their vines, telling me that they need additional nutrients and water in order to produce decent sized sweet potatoes. Cheers! Great idea and I’ll try it out. I’ve been having trouble with mine. All store bought. I’m suspending them in water with tooth picks. Did find two sights that said it makes a difference which end is in the water. Here is the quote. 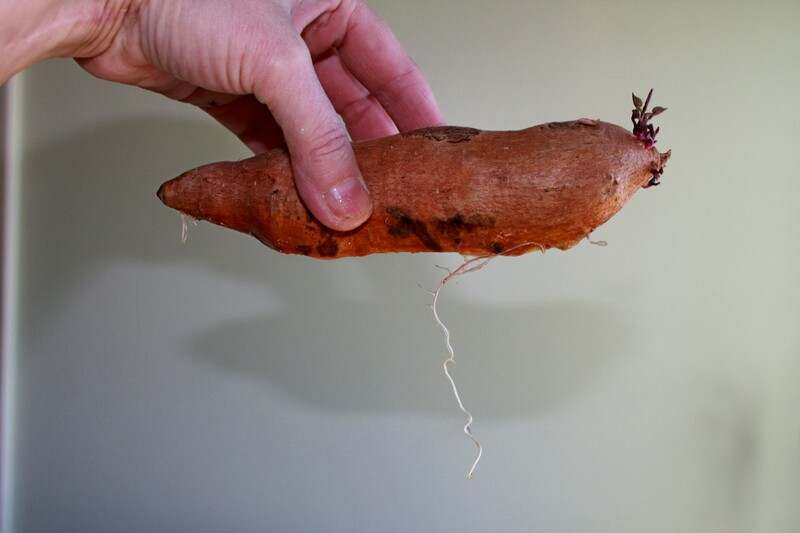 ” Unlike “Irish” potatoes, sweet potatoes only have meristematic tissue capable of growing shoots on one end, in my experience, and the other end (generally the more pointy end) grows root tissue.”. Another article said the pointy end is where the roots come out. Does this seem right to you? You are right on both counts. Pointy end down for roots. 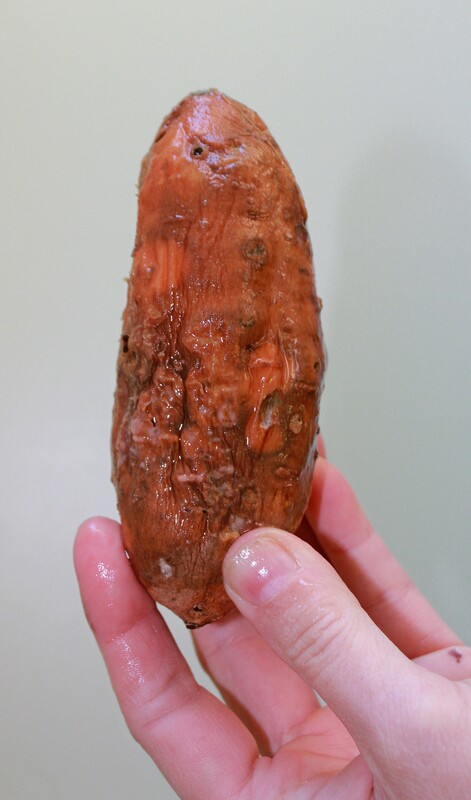 I started my sweet potatoes in water a few days ago and two of them appear to have mold growing on them. This is my first time trying to root the potatoes, is this normal? They are organic from an organic store. You might try an acid soak for a couple minutes in diluted vinegar (1 tblsp per cup of water) That should knock out some the bacteria, hopefully without damaging any sprout eyes. I would then rinse them carefully afterward and place in fresh, clean water. Its been 3 weeks and all of my sweet potatoes are starting to sprout. About half are organic and they are from 3 different stores. (I have left the little stickers on them so I can tell which are organic and which are not.) The one in sawdust is not as quick as the other ones that I soaked in water. I’m guessing sawdust ones would be less likely to rot. I have had one soaked in water that I have had to trim. I used 2 ester-C tablets. A few got soaked for several hours because I forgot about them and that hasn’t been a problem. I submerged the entire potato in the solution. The ones I suspended by toothpicks seem no different than the ones I put in a yogurt container & half-filled with water. I have been changing the water once a week. The potato I cut into pieces after soaking was not successful. I set them on the counter to cure (dry the cut edges so they are sealed) and the whole thing molded in a few days. Not sure what I did there. A bag of seed potatoes around here is $8.00 and even at that, no sweet potato starts anywhere. Looking forward to some potatoes this season. Yay! Super!!! It’s so simple, yet so effective. Enjoy your bounty this fall. Thanks for letting me know your results. Flourescent Lights leaving the potato out and spraying it with water once every week. I have fully bloomed sweet potatoes. Now where to plant them lol. I never thot of that. Sounds like it would work. Very cool. is this solution for sweet potatos treated with metham sodium or chlorpropham? I’m trying to propagate white sweet potato which is hard to get hold of where I live and it’s not working yet. I did the vitamin C wash yesterday and crossed my fingers. I think metham sodium is more likely to be used here. About the only way you could find out for certain is to ask the sweet potato company what they used. I do not have access to a regular lab and have no idea of what my potatoes were treated wtih but it was definitely something due to the response by the Vit. C application vs. the control. Good luck! Sue, am excited to read you have buds forming on your vertical ones. No roots yet… how long have you been doing your experiment now? I had better luck with my vertical sweet potato than I did my horizontal one with a strip of material shaved off. Even then, roots formed around the perimeter of the cut and then roots started to grow out of the cut portion. It is’t rotting but is not as good as the vertical in terms of budding. My vertical potato has crowded slips that are 1-2 inches long. I broke one off yesterday and am attempting to root it in water separately in an effort to give the other slips more sunlight. I also moved my horizontally rooting/budding potato vertical in a glass of water so more surface area would be covered with water. Hope it speeds up the process. I like your “growing sweet potato slips if it kills you!” Hope it doesn’t come to that!!!! Well, part of my experiment seems to be a dead loss, so far. BUT… I wanted to try something I’d heard of in the past, so I combined the methods, and I am realizing that was probably a mistake. And I think I’ve learned something to contribute to Tam’s experiment. The method that I wanted to try was cutting the sweet potato tuber lengthwise and letting the cut side sit in shallow water. I did the Vit. C dip as directed, then cut the tubers and set them in the pan. I rinsed them every day and added fresh water, but almost from the beginning I was getting a fairly strong odor of vinegar and some white mold forming on the upper sides of the tubers. I started this on Feb. 20, so it’s been a little over two weeks. Still having the odor, no sprouts, mold is spreading, today they go into the compost pile. But on the same starting day, I took another tuber, did the dip, stuck three toothpicks in it and suspended it in a jar of water. Today, this tuber has tiny nubs of roots starting, but no top sprouts yet. I only change the water every few days or so, and there is no vinegar odor. I strongly suspect that this method doesn’t work for any tuber that has a submerged cut on it. Maybe using the exposed cut doesn’t work on ANY method, the cut exposing the tuber to bacteria and fungus. The exposed cut on mine seems to slough off orange tuber material into the water, and that is fermenting, which is causing the vinegar odor. After dumping the current batch of cut tubers, I will be starting another batch and using the toothpick/vertical method after soaking in the Vit. C solution. I am going to get sweet potatoes if it kills me! How much water do you dissolve the Vitamin C in? Ron, I used a 1.5 cups of water approximately. Let me know how yours turns out. My sprouts are now 1-2 inches tall and my roots are up to 5 inches long. I will run to the store and try this! thank you for sharing!